These KyEHC horses will be available to view for adoption at the Ky Horse Park’s John Henry Memorial Adoption Fair Saturday, June 27th at 4:30 pm in the Indoor Arena. Admission is Free. Background Info: Spurt came to KyEHC from Churchill Downs. Her previous owners decided to retire her from racing after she fractured a sesamoid. After a physical exam and radiographs, the vets decided she has an excellent prognosis for recovery. So she received the rehab time and care she needed, after which she was declared sound and able to begin retraining. She is good for the farrier and the vet. She gets along with mares and geldings. Recommended Uses: Spurt has great athletic potential. She has adjusted to farm life quite well and is progressing quickly in her training. Spurt would make a nice low-level performance horse or a good pleasure horse. Most Notable Personality Trait: Spurt is a “diva” kind of horse. She likes to look good. When she knows she’s looking good, she likes to show off. She has a carefree spirit about her. Most Challenging Issue: Sometimes Spurt likes to be in charge. She will test an inexperienced person to see what she can get away with. A confident handler can easily deal with the challenges she likes to give. Level of Training: Spurt is progressing well with her retraining. She enjoys being ridden out in open fields and is learning how to handle going over tarps and poles. She is being ridden is a western saddle, using a tom-thumb bit. Since she likes to challenge inexperienced riders, she is not recommended for beginning riders. 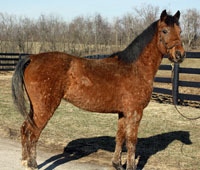 Background Info: PB came to the Kentucky Equine Humane Center as an emaciated, untrained stallion. He was hard to catch and handle and difficult for the farrier and the vet. With time and patience he has become a very lovable horse. The first thing the staff and volunteers at KyEHC worked on was getting PB to trust them. He has now learned being around people can be a good thing. He really likes attention and will come meet you at the gate. Though getting shots isn’t one of his favorite activities, he is much better with the vets and he stands well for the farrier. Recommended Uses: Pretty Boy has an open suggested athletic potential. While he is doing very well in his training, at this time he would not be recommended for a beginner rider. 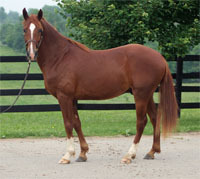 Even though his previous owners listed him as a TWH, he does not display the gaits attributed to that breed. PB would make an excellent trail horse or a show horse project. Most Notable Personality Trait: PB has gone from being a scared, hard to handle horse to being a lovable, easy to handle favorite. He now loves attention and will let even small children groom him. Most Challenging Issue: When working with PB, you have to keep his mind busy. He tends to get bored if you do the same thing too many times. If you keep it interesting, he loves learning new things. Level of Training: Pretty Boy is ready for an intermediate rider to take him on a trail ride or get him ready for the show ring. He is being ridden in a western saddle, using a tom thumb bit. He is learning to neck rein and how to navigate trail obstacles. Background Info: Strawberry came from Harlan Co. in southeastern KY. She was a “stray” that no one would claim. The animal control office spent a great deal of time trying to catch her. They found a foster home for her while they tried to find out who owned her. When she came to KyEHC, she was so scared of people that only three people at the KyEHC took care of her. They worked teaching her to lead, stand for grooming and stand for the farrier. Slowly, they introduced her to other people and horses. Once she gets to know you, she will love attention from you. Recommended Uses: Strawberry got an excellent vet report. She should have unlimited potential. 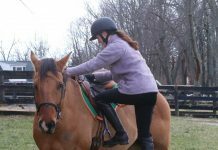 Since she is still young and has not been started under saddle, it is recommended that someone with experience in training work with her as she begins her riding career. Most Notable Personality Trait: Strawberry is like a class clown. She likes attention focused on her. She is playful and nosy. She likes to know what is going on around her. In a herd situation she is everyone’s friend. She gets along with mares and gelding, older horses and young ones. Most Challenging Issue: Since Strawberry had little contact with people for several months, it takes her a little while to trust someone new. You can’t rush her when getting to know her. Level of Training: Strawberry is currently in Parelli Training. She is learning the “Seven Games”. Since she has a playful personality and loves learning new things this style of training seems to be working well with her. She is ready for “her person” to take her home and get her ready for some fun times and memorable experiences. Background Info: Accreditation came to KyEHC from Turfway Park in Florence, KY. He had injured his left front leg. His owners decided to retire him from racing. Vets have examined Accreditation and have taken radiographs of his leg. While he probably will not be able to have a career in jumping, he is still has great potential. Recommended Uses: Accreditation will make a wonderful show or pleasure horse, and should be able to do any type of flat work. 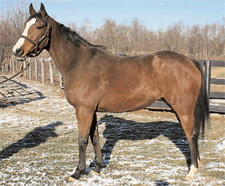 He would also make a great family horse as he can handle riders with all levels of experience. Most Notable Personality Trait: Accreditation adjusted to life away from the race track quickly. He was quite high strung when he arrived at the center, but he soon learned that the farm was a nice place to “just be a horse”. He adapts to changes very well, whether is changes in his daily routine, pasture mates or riders. He is a “go with the flow” kind of horse. He is good for the farrier and the vet. He enjoys a bath and getting groomed. Most Challenging Issue: AC likes to eat. His food intake needs to be monitored because the vets say he is an easy keeper. He wears a grazing muzzle because eating seems to occupy a lot of his time in the pasture. Level of Training: Accreditation is currently being trained in western riding. He is ridden with a western saddle and a snaffle bit. He knows leg, hand and seat cues. He will back when asked. He is learning to neck rein. He stands still for tacking and mounting. He will ride alone or with other horses. He is learning to handle trail obstacles. 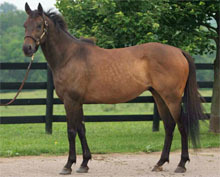 For more information on these or any of the other horses at the Kentucky Equine Humane Center, visit /redirect.php?location=http%3a%2f%2fwww.kyehc.org%2f.